Top - Age 16 working in a dress shop. Does she look Swedish? Gary's Mom was born in Minneapolis, Minnesota to a well-to-do family. 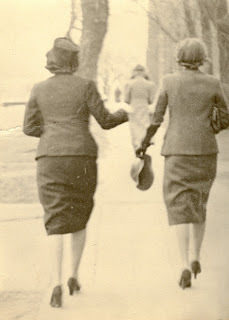 Nellie Workman married Carl Oscar Krantz and they named their first daughter Alice and their second daughter MaryAnn. MaryAnn - does that sound familiar? MaryAnn is Nellie Workman's mom's name - Gary's Mom was named after her own Grandma. They lived in a big house near the "proverbial" city lakes. The house was built at the turn of the century and was, by all accounts, HUGE. Her family had servants (at least one maid) and my Great-Grandma Nellie was one of the first women to drive an automobile down her street - in the neighborhood. Great-Grandma Nellie and Great-Grandpa Oscar were Irish and Swedish respectively and Oscar was a first generation American businessman in the city. 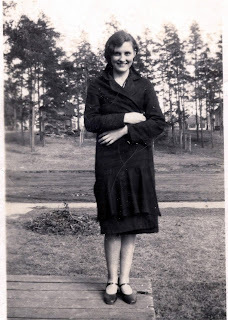 My Grandma, MaryAnn, was born in 1917 and she was just a 12 year old pre-teenager when the depression hit. During the early years of the depression, my Great-Grandpa Oscar lost everything. Yes, Miss MaryAnn Mathilda Krantz and her older sister Alice lived a luxurious life in Minneapolis until they were 8-10 - but I heard very little about that life, Grandma Mary talked about what came after the crash so much more than what came before. After the Krantz's lost Grandpa Oscar's job, their home and all of their worldly posssessions - they got in a car and made the 5 day journey (back then during the days of dirt roads) to Bemidji, MN to live with Nellie Workman's parents (John and MaryAnn Workman) on the farm. I don't know if they drove to Bemidji in their car or if they borrowed it...Grandma did mention that the car Nellie famously drove down the Minneapolis cobblestone road was lost in the Depression. You'd think that losing everything at age 12 would leave a scar or trauma but Grandma never spoke much about the loss of her home. As a matter of fact, she seemed pretty excited at the opportunity of living on a multi-generational farm. She told me stories of her Grandma's Summer Kitchen which was a large, comfortable shed out in the middle of the back yard with a fully outfitted kitchen. By cooking from this second, outdoor kitchen, they would can foods throughout the summer without getting the whole house warm. My Grandma told me of trading with Indians for wild rice and sharing secrets of maple sugaring. They lived so close to the land in those days. Every type of food had their season in Minnesota and my Grandma's taste always followed the ripe food or seasonal treat. In late spring - there was maple sugar, in summer there were raspberry pancakes and in late summer blueberry pancakes... There was always cold milk and big slices of brown toast with cheese. From July to August, there was an abundance of vegetables - heaping piles of snap beans, corn and even sugar beets. Although it was a lot of work my Grandmother enjoyed the satisfaction of looking in the root cellar come September and seeing endless gleeming glass jars filled with food that would last the whole winter. The farm suited my Grandma much better than the city ever could. She preferred Gingham and denim dungarees over wool formal clothes any day. She and her sister played as hard as they worked - they swam in the lakes with a pack of kids and we have photos of her eating ice cream cones with her friends in front of a sign that says 5 cents a cone. MaryAnn went on to graduate from Bemidji State University and go on to be a teacher. She loved to dance, she loved her family and she always kept a beautiful pantry or larder in memory of her family heritage and her Mom, Nellie ; and her Grandmothers Carrie and MaryAnn would have been sooooo proud. My dear Grandma Mary canned every summer until she passed away in January, 2001. She lived and laughed well and even made it to the 21st century.